For the average marketer, this can feel like a daunting change. You may just be getting the hang of this whole content marketing thing, where you are trying to provide value by educating your prospects instead of telling them about your products and services. And now you have to tell them a story. Is that in addition to trying to educate them, or instead of that? You feel like new parent with that deer-in-the-headlights look. If only someone would tell you what to do. I work for a big company, and there are already plenty of stories about the company, and even our specific product suite. But that’s not where I’m going with our content. I have been thinking about story differently. I am using small moments of story to catch people off guard. (highlight to tweet) They are reading about a marketing topic, and suddenly they encounter a brief scene that they were not expecting. It could be a simple visual metaphor, but it could also feel like a very short story. 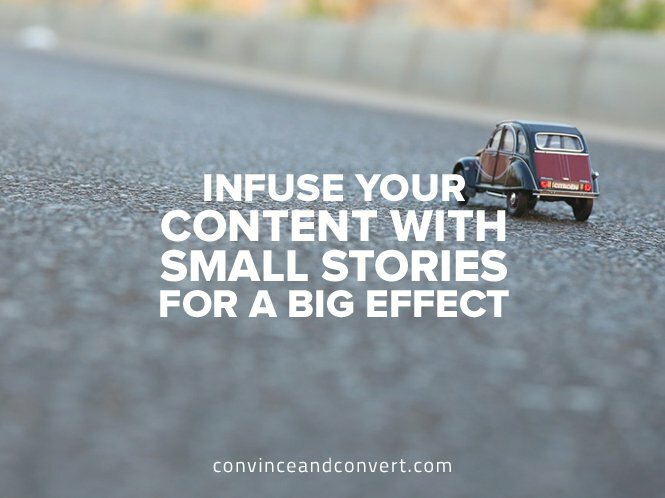 In the middle of an ebook or other type of top-of-funnel content, I’ve created a short story in their mind.